Just like last year, I planted a bunch o’ tomatoes in the garden in the back yard. Unlike last year, my tomatoes this year came under attack (ATTACK I say!) by bugs. First it was worms (tomato worms? Hornworms? I don’t know. Icky worms). Then came the stinkbugs. All my tomatoes were being eaten and rotting before they even started to ripen and I hadn’t gotten a single tomato for me to eat. I wanted to evict the bugs, for sure, but I didn’t want to do it with a bunch of chemicals — sort of defeats a large part of the purpose of growing them in the back yard, you know? I use a powdered sugar shaker full of cornstarch to cover the leaves, the tomatoes, and the ground around them. The plants look ridiculous, sure, but guess what? The tomatoes are MINE again! So glad to know this trick is also keeping squirrels away!! That has been my big problem the past couple of years, so I finally gave up and didn’t plant any tomatoes this year. Next year I will, and I will use this tip! What a wonderful idea. Will try this in my garden. Wonder if it works with cabbage moth. My! I learn something new every day. Thank you for this handy, inexpensive, eco friendly tip. I love squirrels like I love home-grown veggies. This will come in handy. This is such a great tip! I sprinkled my tomato plant and herbs with cornstarch on your suggestion and hooray no more worms gnawing on my plants! It is fantastic! My deck looks a little crazy covered in powder, but it works! You can also plant marigolds by your tomatoes to keep the bugs away. Marigolds around the entire garden works great. Tomatoes, do not like marigolds because they take the nutrients from tomatoes. Who knew?!? I had hornworms at the end of the season last year, if they show their ugly heads again I’m dusting them ASAP! Great tip, thanks!! Awesome! I am going to try this! I got chipmunks, squirrels and fire ants all eating my tomatoes. They don’t eat basil, mint or peppers though, just my tomatoes. Tomorrow, 1st stop in the grocery store, Corn Starch! I have tried the cornstarch now, but I’ve got a bad aphid (or maybe stink bug?) problem and now the grasshoppers have showed up. At first it was just on one plant and I was happy to let them have that one and leave the others alone, but now they all have it, even with the cornstarch. Oh well, I had a good run at the beginning of the season. Next year, I’ll start with the cornstarch before the bugs even hit and keep re-applying! Here’s hoping! Re-applying is definitely key! I have to head back out there after it rains (you know, both times it rained this summer) and cover them again or the stinkbugs are back way too soon. Here’s hoping for bug-free tomatoes for all of us next year! So far none of above problems for our tomatoes ( 50 plants a year ) but wind is big. I am going to try this on Broccoli, Cauliflower and Cabbage and if it works, it will be super big for us. Right now after 2 cuttings we need to remove the plants and burn them for the worms. My garden group has a couple of questions regarding this idea! How does it effect photosynthasis regarding the plants and does it wash off in rain or cluster? I am POSITIVE that y’all know more about gardening than I do. 😉 It just washes off in rain (or if, say, your five year old is watering the garden with a hose… just for example), and I haven’t noticed any ill effects photosynthesis-wise. You can use a blacklight at night to find the worms also. Has anyone tried this to get Japanese beetles off rose bushes? They’re eating everything in sight! Plant rue to deter Japanese beetles. It’s not beyond reason to think that the Monsanto BT gene product that is in corn to prevent corn borer worm and other insects eating the corn is still present in the cornstarch… and killing the caterpillars that are eating your plants. GMO is everywhere and pervasive. The BT gene has spread on the wind to non GMO fields. you can use black pepper on any of the cabbage family for bugs. It realy works. Im trying this today on my toms which are being ravaged by cabbage moth caterpillars. And Im in Australia using non GM modified cornflour, so we shall see if the above hypothesis has any merit. Please report back and let me know how it goes! Please let me know if this works on grasshoppers, they ate everything Ib my garden last year. Oh no! I don’t actually know if it does, but I think it’s worth a shot! Anyone know if the cornstartch works on earwigs? That’s my biggest colprit. Are the plants wet when you apply the cornstarch? I did them dry and the cornstarch seemed to cling pretty well, but I would assume that it would stick even better right after a watering! I’m so excited to read this, I gave up growing anything because of squirrels. I’m going to try this year, thanks! Defintely gonna try this..I have problems with all of those critters an bugs you are all mentioning an I really dont want to use any chemicals..Will let you know how it works..Thanks for the tips..Yes we do learn something new everyday!!! Thank you everyone for the very helpful information. I live in North Carolina and my tomatoes and compost have been invaded by fire ants. I realize this is a very old post, But so am I…lol I live in Florida where the fire ants stay on vacation year round. I have a huge piece of property and 120 billion plants in pots as well.lol The fire ants decided to build colonies in each pot. I had ZERO intention of repoting 120 Kazillion. …..or was that a billion. ..lol. Nor will I use chemicals. Soooo I decided to use cinnamon. Just a little tab on top of soil. Then the fun began. Pulled up a chair and watched them run up and grab up some, Like a thief in the night.They must of thought Whoop-Whoop ParTee.While Each little worker ant was thinking, The queens gonna love this!-I’LL now be her favorite little worker. Their gone now, Lets have a moment of silence. RIP you little..% ₩¥£.&^/$#(!! Now who’s saying Whoop-Whoop ParTee. I don’t have a problem with bugs eating my tomatoes but I have a problem with rabbits eating my bean plants before they begin to flower. Any ideas on a natural way to keep them away? I do use soap to keep the deer away and that does work but it doesn’t seem to work on rabbits. That would take care of all of the critters! What kind of soap or how do you do the soap to keep deer away ? Put down blood/bone meal. Rabbits hate that stuff! Try cayenne pepper for squirrels and rabbits. Or puree a habanera pepper, add some garlic, and mix it in an old gallon milk jug. Spray over plants that are frequented by squirrels and rabbits. Please rethink the hot pepper treatment: ANY bird or animal (or child) that gets this into their mouths or eyes are absolutely miserable with pain! And the fiery oils are also transferred to their babies when they feed or touch them. Remember, ALL wildlife, children or pets in contact with the treated area will be affected. I believe there are more humane ways to deter these pests, hope you find one that works! Out of desperation, I put a whirly gig in my tomatoes to get rid of rabbits. It worked!! It is a metallic one. Don’t know if it is the motion or the reflections from the moon. Were did you get such a gadget. I’ am interested in anything that might be useful. Did it work for you? We put up a fence to keep out peter rabbit but this might be useful for other things as well. We have had so much rain here in North Carolina. My poor tomatoes!Been dealing with early blight and sephoria all morning! You can also go to the Dollar Tree for the metallic ones. Only a dollar each. Good luck. I also tried Zest Bar Soap . Used potatoe peeler to make shavings and put around ur garden. As i had pots,i did sovaroundpots. It worked kept intruders out. I used zest bar soap shavings all around my pots n small garden. It worked well keeping intruders out. My grandma used to tie a string around and through her garden with tin pans tied onto the string. They flutter in the wind and make noise plus reflect the light. She was critter free. Most all corn products, unless organic, are GMO. Bugs are smart,they knew not to come near the plants, since it was full of GMO residue. Using Irish Spring or Zest soap, highly toxic, artificial fragrance and chemical soap product is not good for plants, people, soil, ground water, fish, intruders, whatever. Please think about what you are using on your food and how it affects the environment and beneficial critters. Peggy… Seems like you entered into the SJW phase rather early. Would you rather eat or starve? I will definitely try the cornstarch this next summer, but I also plan to spray with doTERRA Peppermint Essential Oil spritzed with water. It works as a pest control for many bugs and probably animals too! Very strong aroma, but 100% CPTG Natural alternative. what about dish soap and water. will it work? Can you use cornstarch on strawberry plants? The chipmunks and slugs love/my strawberries. I would think so! Worth a shot, certainly — can’t hurt! Thanks for the cornstarch tip. Thank you for cornstarch tip. How do you keep birds from eating everything? I wish I knew! I’ve been looking at a couple bird net things at the Gardener’s Supply site but I haven’t tried them yet. I’m not sure if this will work on your grape vines, but I know that the orchards around here tie tin strips in their trees to keep the birds out. There is something about the way the light hits the tin that scares the birds away. How well does this work on other plants? Specifically, spinach, cantaloupe, berries, etc? I’ve tried it on spinach and it worked great there. I mean, it’s cheap to try and it can’t hurt, so I’d give it a shot! I’m using it again this year on tomatoes, peas, squash and eggplant. No problems with squirrels! I live in Northern California and all the wineries in the valley and hills use shinny long silver and colored eflective strips. They attach them all along their grape vine wires and stakes. They also attach them to tall polls. This defently keeps the birds away. Does cornstarch harm bees? We have some bee hives and we will not use anything that would be harmful to the bees. 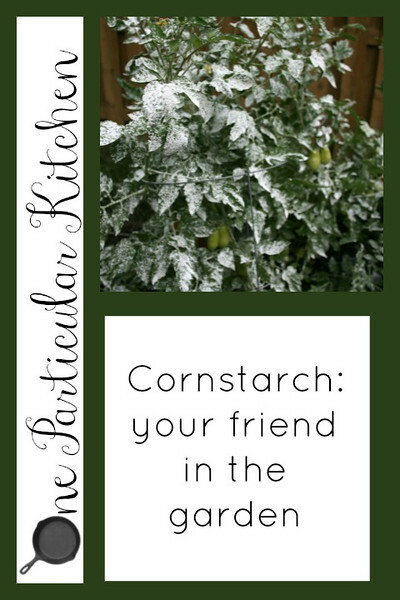 Its been a few years since you posted about cornstarch… is it still effective? It is! I still use it. Cheap and effective. How about squash bugs on pumpkin and gourds? We live in North Missouri and we have more trouble w/those than anything else in our garden. I haven’t tried it on those specifically, but the good news is that it can’t hurt to try, and it’s cheap! Give it a shot? We use flour – live in S Iowa. Hi Peggy! I don’t know why it wouldn’t work on flowers as well — worth a shot! I have NO CLUE about the cornstarch hurting dogs or not; that might be worth a phone call to a vet or something. I don’t have any animals right now (unless you count my children) so I’m not sure. Daffodils!!! I’m going to remember that one. Thanks! Oh I didn’t know that trick! How cool! Cat and or dog hair from your vacuum cleaner will deter rabbits and squirrels. Thanks for this tip! Love all the tips on here. I use crushed egg shells to keep slugs off my plants. The rain doesn’t wash it away and they won’t crawl over the harsh shells. Just lay a ring around the plant. Good for anything that slugs want for dinner. Have any tips to rid my roses of Japanese beatles? Plant four o’clock. Japanese Beatles love to eat them then promptly die, as four o’clock are poisonous. Well now I want to cover my entire yard in four o’clock. Lol @ whole yard… are 4o’clocks poisonous to dogs? Cats? Birds? Rabbits? If not, I may be with you on the whole yard thing! Those dang beetles about destroyed my roses..
Has anyone tried this on zucchini plants for White Flies. We always get hit hard with them every summer and most of our squash plants never get to produce much after an attack. Thanks much. Do you think the cornstarch will work on the bugs eating my radishes and spinach? I live in Ottawa. I put up a 7 foot bird netting around the garden. That was successful for squirrels but not for chipmunks which are now taking the tomatoes. Outside the bird netting I have a wire fence to keep groundhogs out. I am trying a mix of castor oil and detergent 1:1 for chipmunks. So happy to find the cornstarch solution. That will be next. We have moles eating our tomato plant roots which kills them.I actually shot some powder (cornstarch) down several holes. Don’t know it this will help. Is there something else I can do to get the moles to leave? Does the corn starch hurt the bees ? I know Sevin dust kills the bees so we only use liquid. I wonder if the cornstarch will work to keep the worms off of my cabbages? I am going to get me some cornstarch and try it.